Home › Electronics › Ecologic Mart 8 Led Bulbs Book Light With 1.5H Rechargeable 1000Mah Battery 1..
Ecologic Mart 8 Led Bulbs Book Light With 1.5H Rechargeable 1000Mah Battery 1..
READ UNINTERRUPTED (you don't need to rearrange the arms); enjoy the MALLEABILITY and FIRMNESS of each gooseneck and the SUPER BRIGHT 8 LED bulbs that will cover BOTH PAGES. ULTRAFAST CHARGING: We use 1000mA USB output to ensure you receive the fastest, safest charging times. Our light is fully charged in just 1.5 hours. LONGER BATTERY LIFE: Unlike other reading lights that only last a handful of hours, ours can give you up to 10 hours of light on a single charge! TAKE IT EVERYWHERE: Each of our lightweight and adjustable reading lights come standard with an AC charger with dual USB outputs and a 78" USB cable for reading in comfort. Read at home, at the airport, even at work! MANY ADVANTAGES: Extra-long cable, dual-port adapter, double padding, flexible and stable, environmentally friendly, efficient, elegant and ... LIFETIME WARRANTY. Size: 2 ARMS - TRANSLUCENT - COOL LIGHT Some of our advantages over other brands: 2 arms: Covering MORE AREA. 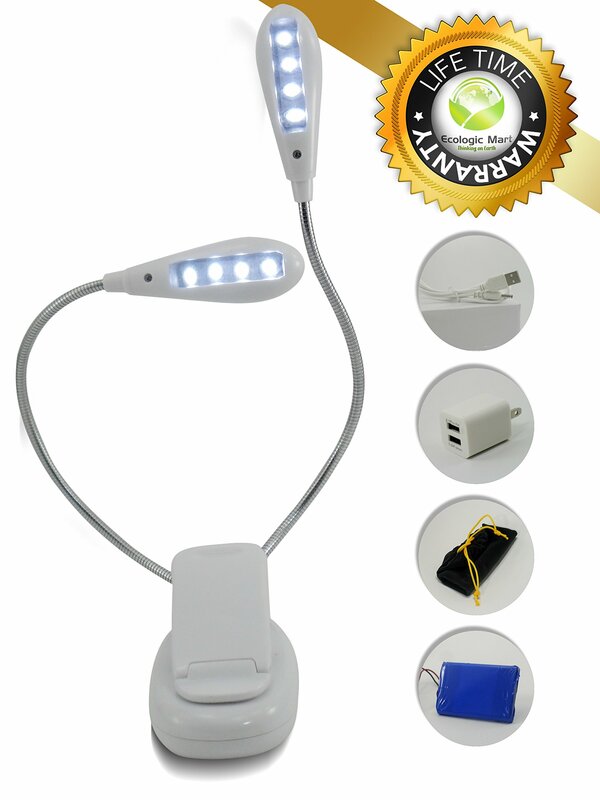 8 LEDs with separate controls for each 4: It can work as a lamp with 1 arm and 4 LEDs and, if necessary, DOUBLE its brightness and coverage area. FASTER CHARGING: 1 to 1.5 hours only! Adapter with 1000mA output is best suited for the included battery. If the current was less would load slower, if greater, energy is lost as heat and may reduce battery life. 5 levels of intensity. Rechargeable 1000mAh. Charger with additional output of 2.1A. 2 meter cable. Practical bag to carry it. Several colors available. Double padding: Less chance of slipping. Many people have given this lamp loved ones as a birthday, Christmas or Valentine's Day and have been very pleased. Useful, Lightweight, Portable, Rechargeable, Efficient, Complete, Beautiful, High Quality, Low Price. It is an indispensable accessory for musicians and travelers. Full Manufacturer Warranty30 days money-back no questions, returns orrefunds without time limit. Thank you for your trust! Ecologic Mart Team We are here to serve.